Fabio Perini S.p.A, Tissue Machinery Company S.p.A., BaoSuo Paper Machinery Manufacture Co., Ltd., and STAX Technologies D.O.O., are among the most prominent enterprises in the global tissue paper packaging machines market. Together they wield a considerable influence on the global tissue paper packaging machines market. These market players are identified by high capacity and highly automated machines, finds Transparency Market Research (TMR) in a recent study. Investment in innovations and developing competencies has significantly risen among these companies, as they aim at accelerating their growth pace. Besides this, they have their focus on expanding their footprint to sustain their global positions. In addition, their efforts are aimed at updating their offerings to gain better traction amidst the prevailing competition. Given the scenario, the global tissue paper packaging market will witness several technological advancements in the coming years. According to TMR, the global tissue paper packaging machines market is projected to surpass US$321.8 mn by the end of 2027. In 2016, the market was valued at US$194.4 mn. 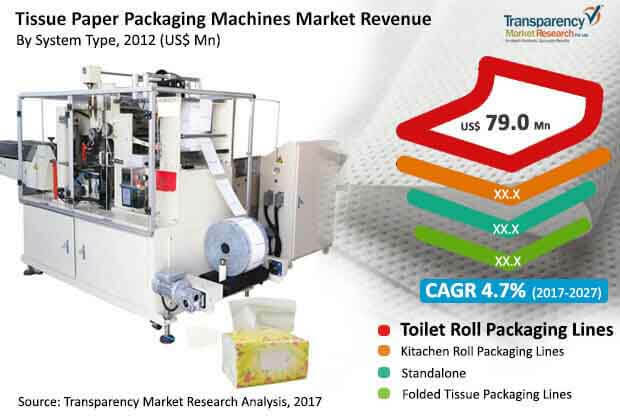 Considering the estimated and historic market figures hold true, the global tissue paper packaging machines market will expand at a CAGR of 4.7% between 2017 and 2027. Among key system types available in the market, the toilet roll packaging lines segment was estimated to hold the dominant 47.2% in the global market in 2017. As per TMR, North America held the lead in the global tissue paper packaging machines market in 2017. The globally increasing urban population and subsequently rising concerns among people regarding better hygiene, fuelling the use of tissue paper products are driving the market for tissue paper products, in turn giving impetus to the global tissue paper packaging machinery market. Other than this, the market will gain immensely as companies invest in novel machineries as a part of their brand building activity. Considering the highly competitive environment they have to operate in, most companies are wary about their process of product development and its alignment with their brand strategies. They are constantly focusing on improving the end user experience, which will enable the global tissue paper packaging machines market gain significant momentum in the coming years. In the coming years, the market will benefit from technological advancements and automation introduced in the production process. As a result of evolving technologies and automation services the demand for advanced machinery has increased in the global tissue paper packaging machines market. Subsequently, recent technological advancements in the production of packaging lines and standalone machines have enabled the manufacturers produce in larger volumes. Despite growth prospects witnessed worldwide, the slow acceptance of proper hygiene and the availability of economic alternatives are creating hindrances for the global tissue paper packaging market. This is especially true in case of underdeveloped economies where the pace of adopting novel hygiene solutions is way lesser than that of developed economies. A majority of consumers living across emerging nations also prefer more economic solutions which pose threat to the market’s growth. Furthermore, the market is negatively impacted by the economic instability in South America. The Russia-Ukraine conflict, which has negatively impacted technological advancements, has affected the growth of trade in the region, in turn creating obstacles for the tissue paper packaging machines market.